It’s finally here!!! Nice Girls Crew is now on the CAAM Channel. Check back weekly for a new episode in this 5 part series! Nice Girls Crew is a raunchy Bridesmaid meets-Arrested Development, no-holds-barred comedy series starring an all-star cast of actresses (Sheetal Sheth as Leena, Michelle Krusiec as Geraldine, and Lynn Chen as Sophie)! In the first book club meeting, the girls discuss Harry Potter: Prisoner of Azkaban! (Or try to anyways). This week, the girls dissect Dave Eggers’ A Heartbreaking Work of Staggering Genius. But where one finds the memoir moving, others have a sliiightly different interpretation, taking shots at everyone from the Girl Scouts to Donald Draper. IN EPISODE 4, spoken word gets a once over as the girls perform the notorious poetry collection HOWL, by Allen Ginsberg. Nothing says team building like some strong prescription medication in this final episode of NICE GIRLS CREW, SEASON 1. 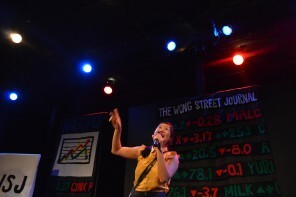 Nice Girls Crew is a production of the Center for Asian American Media (CAAM). Created/written by Christine Kwon and directed/written by Tanuj Chopra. Help make Season 2 AWESOME! Check out our Indiegogo campaign, ok? Nice Girls Crew: Available OCTOBER 2012 on Comcast Cinema Asian America!